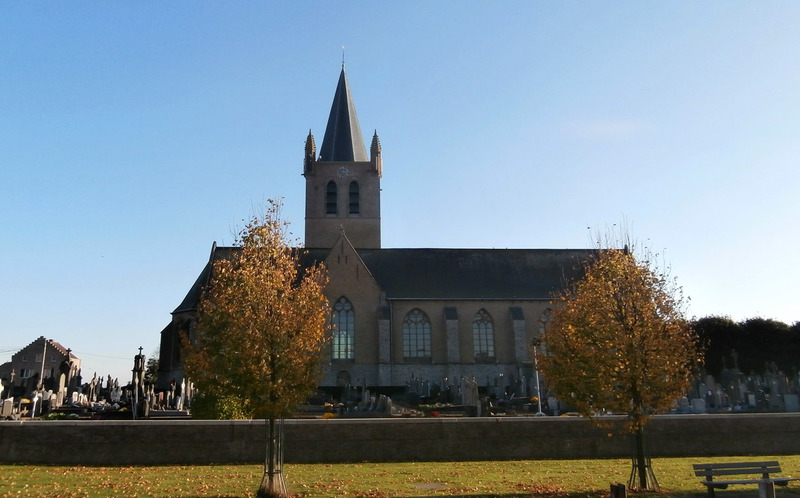 Last October, across the Channel on the trail of the Sunday School Three, we were heading for Ypres via the Messines Ridge when we pulled into the small town of Nieuwkerke (Neuve-Eglise), not far from the French border. Its dominated appropriately enough by a newish looking red-brick church. Fighting around here was particularly intense in 1918 and by the end of the First World War the church was in ruins. There was more to come in 1940. The evening sun was sparkling as we searched the small tightly-packed churchyard for Francis Augustus Gregory from Graveney Road. There were a couple of freshly-dug graves and the earth was rich and moist, the texture and colour of chocolate fudge cake. It wasn’t hard to find Frank and we noticed immediately that his grave was huddled up close to six other East Surreys and they all died on the same day. With the excitement of everything else going on and another 40 Summerstown182 names to look for we forgot about following-up on Frank, until the anniversary of his death a few weeks ago. Ginny put together a really useful document for us. She got a mate to knock up a speadsheet with all the Summerstown182 deaths in chronological order. Very useful for getting to know them a little better and learn about the circumstances of their deaths and what they were doing around the time that happened. Hence on February 27th I glanced at Ginny’s list and saw that it was exactly one hundred years to the day since the death of Frank Gregory. Frank was in the East Surrey Regiment, like about 24 of the Summerstown182 and that means the war diaries are easy to access. Usually these documents are squirreled away in the National Archives and although they are currently all being digitised, it can be quite difficult to find the right one. But the East Surrey and West Surrey regimental diaries are all on one very easy-to-use website. Within a few minutes it was possible to read the dispassionate typewritten notes which can reveal so much but very often so little. On this occasion though, the diaries for the 1st Battalion gave a very clear picture of what happened to Frank without mentioning him by name. It certainly explained the cluster of graves. Frank died on 27th February 1915 and exactly a century to the day of his death I clicked on the relevant buttons and found what the 1st Battalion were doing on that date. 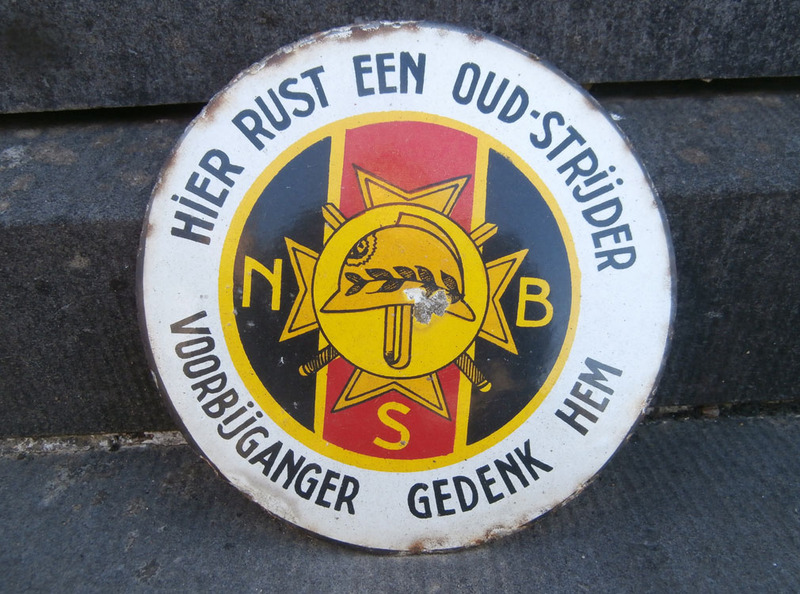 They were in Nieuwkerke and at about 1pm the Germans began shelling the village triggering an evacuation. ‘Before this order could be completely carried out a shell exploded in a house where some of C company were quartered. The house was completely wrecked burying a number of men. Casualties 5 killed and 7 wounded. 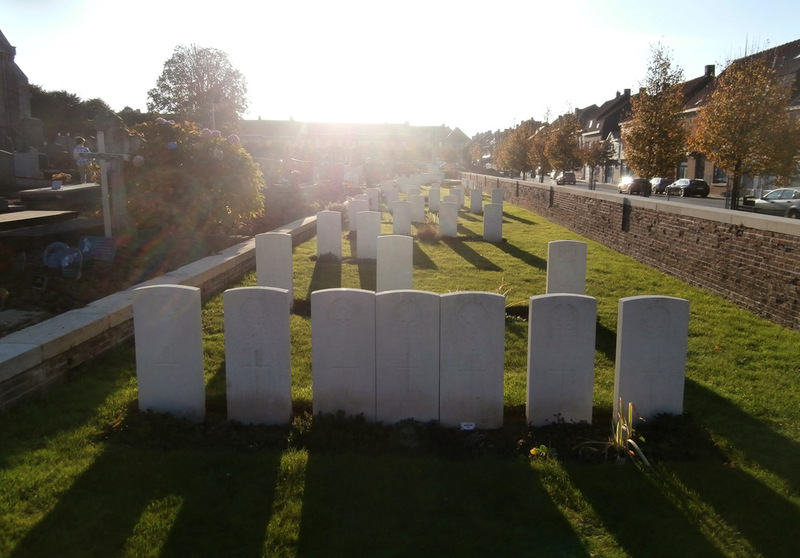 Two of the latter dying subsequently from their wounds.’ One soldier, a Private Gould, mentioned as only having joined the draft the previous day, was partially buried and on being released at once assisted in digging out 8 buried men, ‘He then collapsed’. 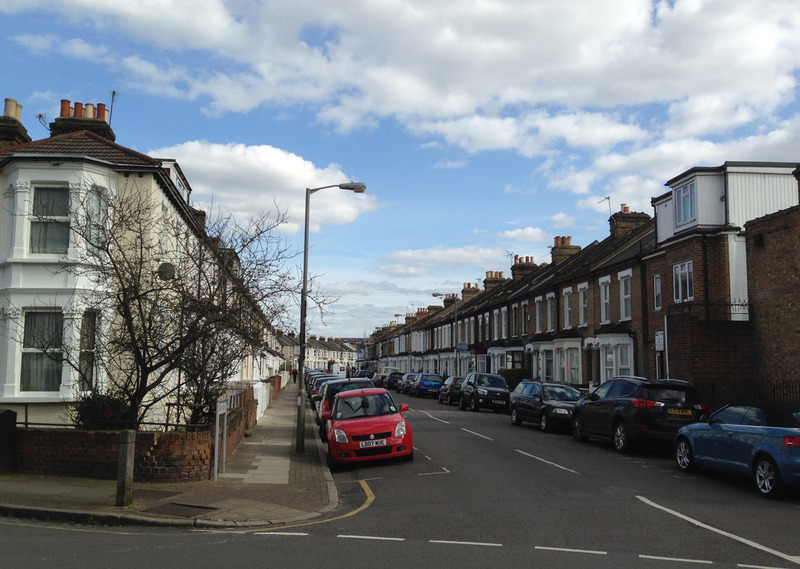 Graveney Road is not strictly Summerstown182 territory, its definitely more connected to Tooting. But its close to Harrington’s Pie and Mash Shop and the section of Selkirk Road that looks like it hasn’t changed much in a century. My main association with Graveney Road is through a damson tree at the junction of Khama Road, roughly opposite No127. It overhangs the road and every few years it drips with fruit which its owner appears to have no interest in picking. About two years ago I went armed with a large piece of tupperware and baked a most delicious tart. Frank’s Dad, Herbert Augustus Gregory was a soldier in the Duke of Wellington’s West Riding Regiment and attested in 1887, two years after he married Catherine Crapper in Wandsworth. He wasn’t so keen on army life or the prospect of going to Egypt or Sudan and the records show that he deserted twice. He worked as a marble polisher and general labourer. Frank was born in 1885 in Clapham, one of five boys. 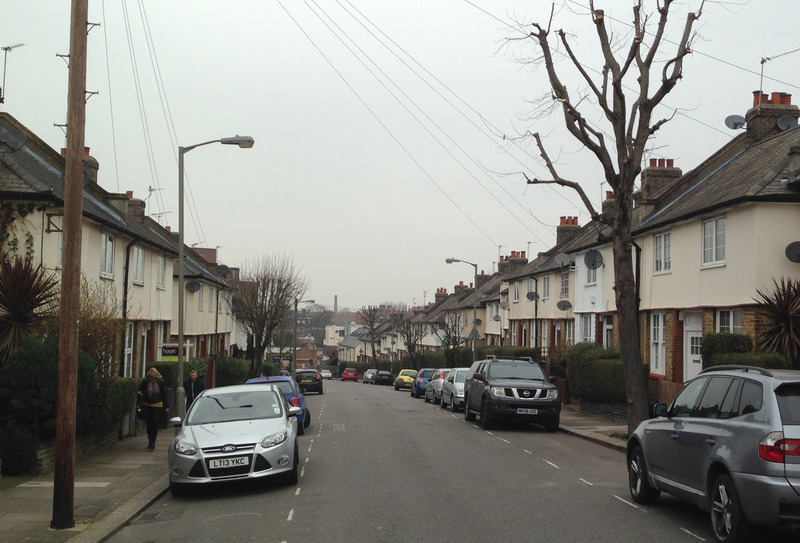 In 1901 the famly lived at 117 Culvert Road, Battersea. By 1911 they were at Graveney Road, Tooting and Frank was working in a greengrocer’s in Wimbledon Road. Two sisters had been added to the family. His eldest brother Isaac married in St Mary’s in 1907 and lived in Summerley Street. Another brother, Charles was discharged from the army with spinal problems caused prior to enlistment when the ‘head of a sledgehammer flew off and hit him in the back’. He later married an Alice Cooper and their son, also Charles, a Corporal in the Royal Armoured Corps was killed in Italy in 1943 and is buried in Naples. Another brother Alfred served in the First World War but was discharged in 1916 ‘having made a mis-statement as to age on enlistment’. Frank himself attested at Kingston in November 1912. 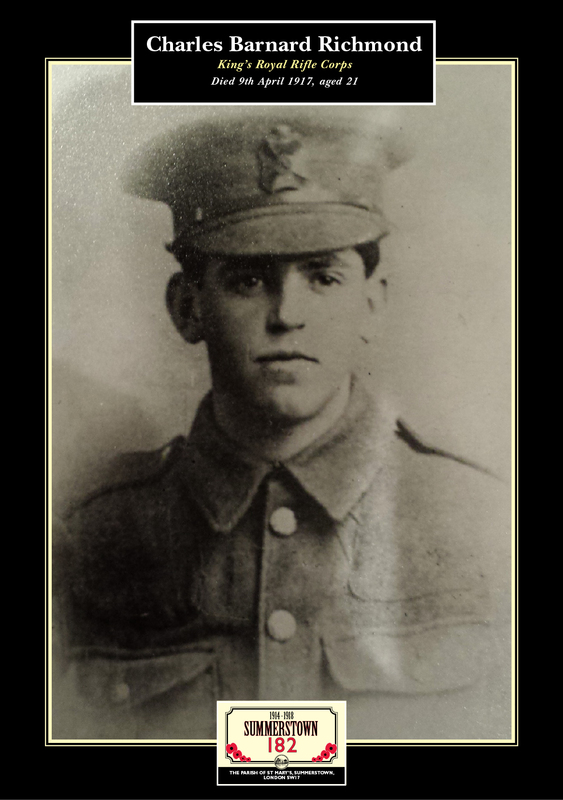 He was still seventeen and joined the third battalion of the East Surrey Regiment. The young fruit and veg assistant worked for ‘S Green’ greengrocers at 25 Wimbledon Road, next door to the home of Eldred Henden. His commute from 127 Graveney Road would have been a brisk seven or eight minute walk up Garratt Lane. In the 1940 bomb damage photo of the stretch of properties at the Blackshaw Road end of Wimbledon Road you can count down from No31 and see a sign that may possibly indicate where the greengrocers once were. 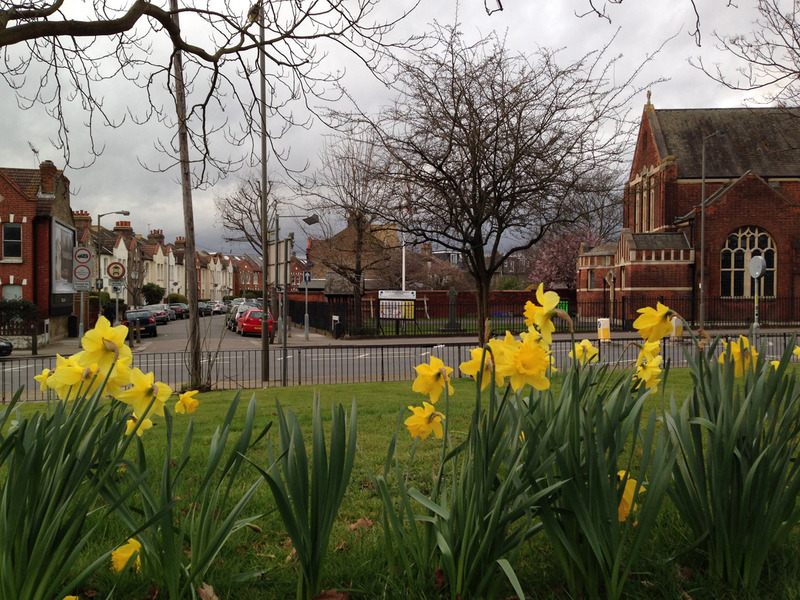 Now its all just a patch of green at the bottom of Chillingford House and at the moment a row of daffodils have sprouted on the grassy bank and nod appreciatively over at St Mary’s Church on the other side of the road, in honour of Frank Gregory and the Summerstown182. 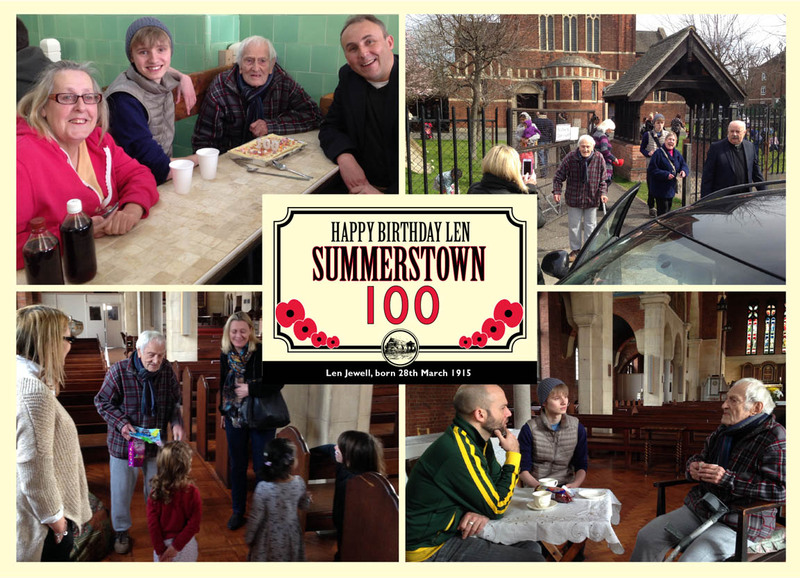 Of all the incredible and wonderful things that have happened in the 18 month existence of the Summerstown182 project, coming across Len Jewell from Tooting takes a lot of beating. Next weekend he will be one hundred years old. We’ve got a lovely day lined up for him including a trip to Summerstown to visit the beautiful church where his Uncle Fred’s name is on the war memorial. We are then taking him on a Summerstown182 circuit, stopping at the base of Chillingford House on the Hazelhurst estate, the location of his father’s family home at No10 Hazelhurst Road. 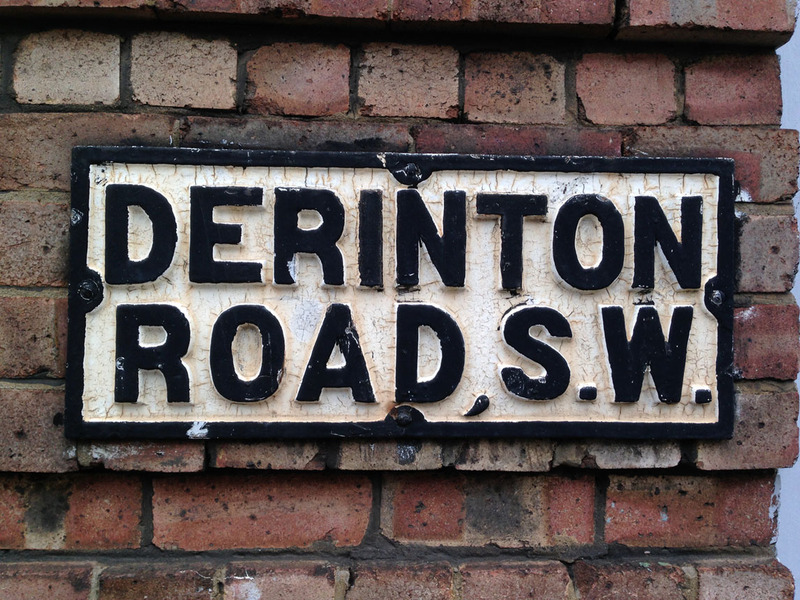 We will visit Wandsworth Cemetery and finish off with pie and mash at Harringtons on Selkirk Road. This Tooting landmark is only seven years older than Len himself and a stone’s throw from 69 Derinton Road where he was born in 1915. The early years of the sprawling network of roads that make up the Totterdown Fields estate. Its where he recalls one of his earliest memories, a German zeppelin flying over Tooting. We confirmed this incident with the legendary ‘Mr Streatham’, John Brown who was able to identify the airship’s serial number and that it was on its way to drop its load on SW16. We only met Len about a month ago and were delighted to be able to show him a photograph of Fred’s grave. It was one of six Summerstown182 graves in Belgium photographed by our man in Flanders, Bart Seynaeve, in the early stages of this project. It was the same day that he discovered the wreath on Louis Danzanvilliers grave at Vlamertinghe. After Christine and Sheila unearthed him, Len wrote us a lovely letter expressing his enthusiasm for our project and his amazement after all this time to find out that his uncle’s name was on a war memorial less than a mile from where he had lived and worked all his life. Len’s grandfather, Thomas Joseph Jewell was a carpenter and joiner from Sutton, married to Emily. His father Joseph Maurice was the oldest of eight children, six boys and two girls. Fred was the second youngest, born in 1893. In the 1891 census the family lived in Prospect Cottages, Point Pleasant. Maybe they toasted the birth of some of their children in the famous Cat’s Back. Quite what they would make of the luxurious development in this corner of ‘Riverside Wandsworth’ is anyone’s guess, but the only carpenters and joiners around there now will be ones who roll up in their vans to do their hammering, chiselling and sawing for someone else. By 1901 they were in central Summerstown at 4 Hazelhurst Road and seven of the children were still present. Three years later they would have had a birds-eye view of the construction of St Mary’s Church and its possible that some of the younger Jewells, including 11 year old Fred were among the six hundred Sunday School children whose names were written on a scroll and buried beneath a stone in the new church. By 1911 the family were at No10. Seven of them are listed as living here in four rooms. At the same address lived nine members of the Daniell family, George Nathaniel Daniell and his seven sons. Three of these sixteen people living at No10 Hazelhurst Road ended up on the St Mary’s war memorial. Fred was now a messenger for the local Government Board. Two of his brothers were glass blowers and a sister Ethel worked at Hugh Stevenson’s box factory. She was 21 and quite possibly was here three years earlier to witness the Corruganza girls’ strike. 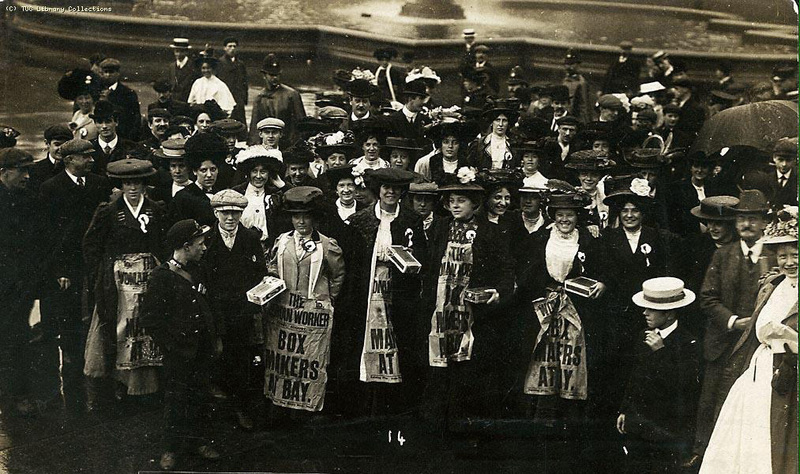 She might even be one of the ladies in the big floral hats who witnessed Mary Macarthur’s speech in Trafalgar Square. Meanwhile Len’s Dad Joseph married Clara Herbert in 1910 in Wandsworth and a year later his brother Maurice was born. 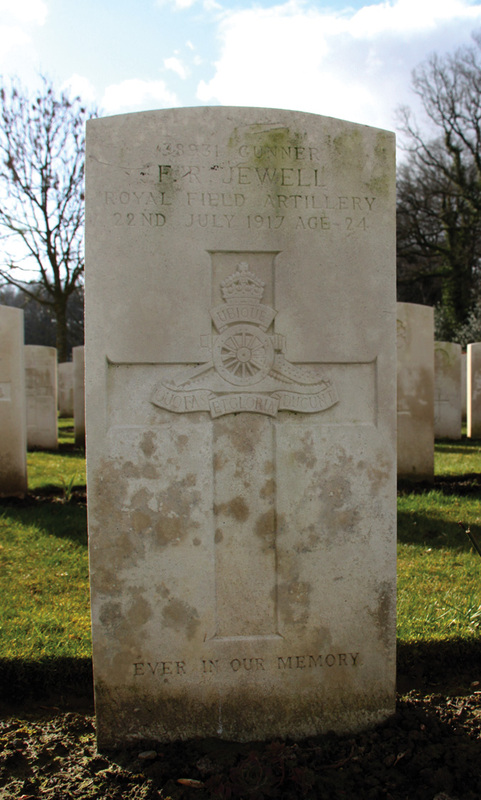 Frederick Richard Jewell joined the army as a gunner in the Royal Field Artillery. He was in ‘A’ Battery, 177th Brigade, attached to the famous 16th Irish Division at Messines. He was very likely involved in the actions there which saw the detonation of 19 enormous mines on 7th June 1917, These were the climax of over a year’s worth of work by the tunnelling companies at Messines Ridge and resulted in the largest man-made explosion in history. In a year of stalemate the subsequent advance at Messines Ridge was one of the few allied breakthroughs. 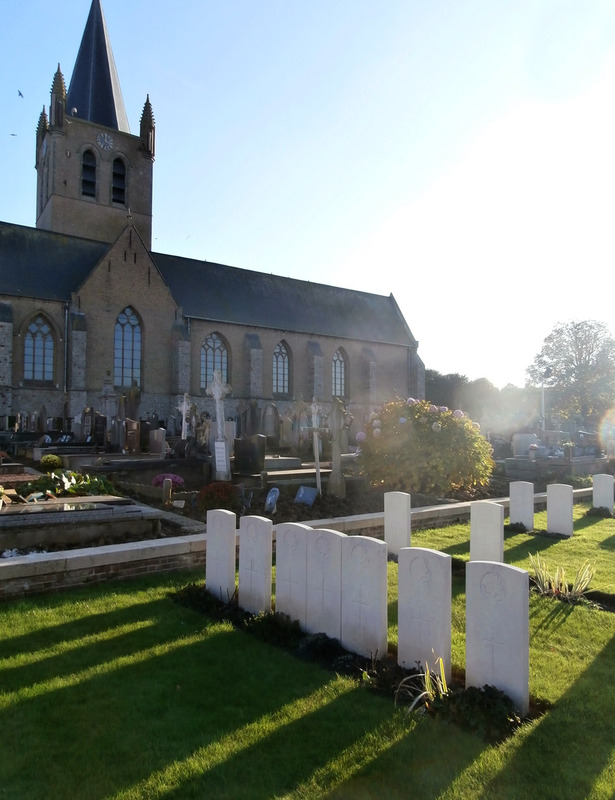 Fred was killed on 22nd July 1917 and is buried in the cemetery at Dozinghem created as a casualty clearing station about four miles north west of Poperinghe. He was joined in this cemetery a month later by another of the Summerstown182, William Moorhouse from 16 Keble Street. Fred’s death occured in the days leading up to the Battle of Passchendaele, a grim mudbath which lasted five months and cost half a million lives without any gains made on either side. Just two days before Fred died, George Nathaniel Daniell who lived under the same roof at No10 Hazelhurst Road also lost his life at Messines. 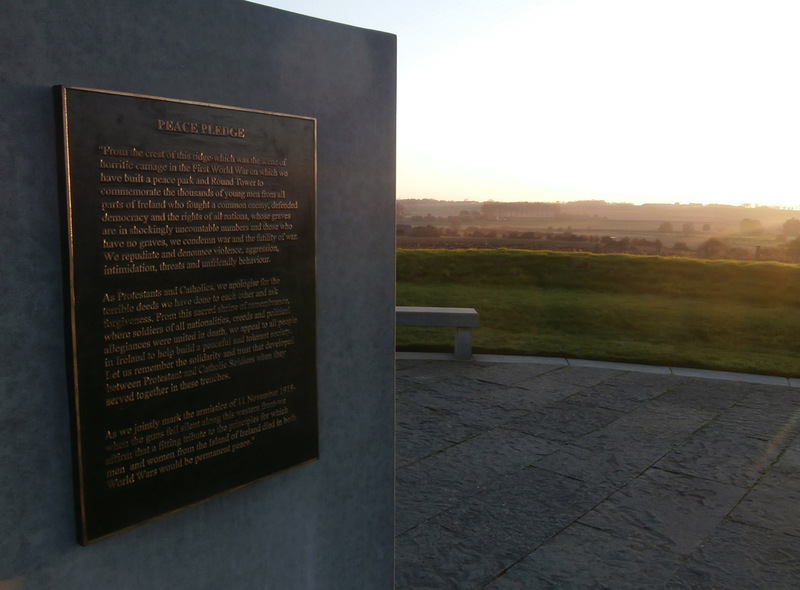 He is buried within sight of the Irish Peace Park, a significant symbol of reconciliation and hope, at the place when catholics and protestants of the 16th Irish and 36th Ulster Divisions fought and died together. Back in Tooting we haven’t found any record so far of Len’s father serving in the First World War, though an older brother Walter was in the Royal Fusiliers. He suffered shrapnel wounds on the Somme and was discharged from the army in 1917, shortly after his nephew’s second birthday. In the Second World War, Len’s younger brother Douglas was a Sergeant in the Royal Artillery and was killed aged 23 in 1942. He is buried in Nicosia. 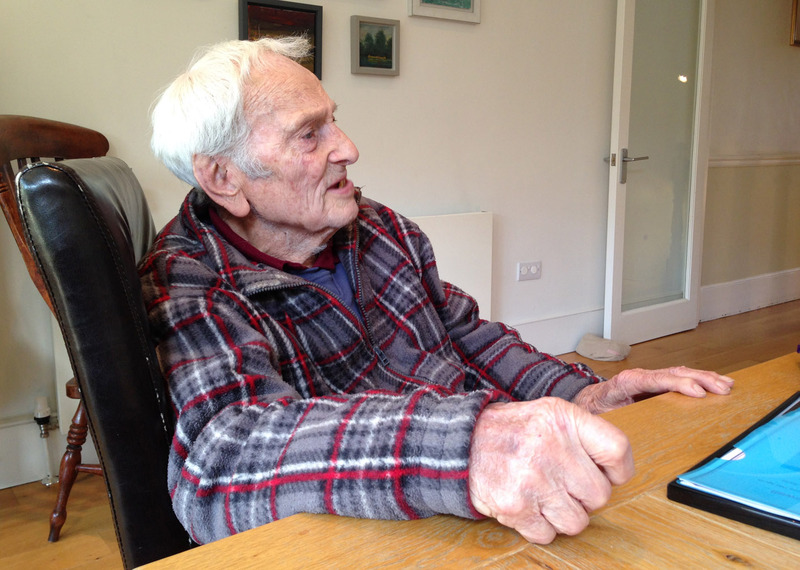 Len told us that he never remembered his father ever talking about his brother Fred and observed that in those days people weren’t so open in their family conversations. He has had a long and full life and we are looking forward to finding out more about it. He worked as a welder and over the years has rubbed shoulders with many of the great, the good and the ever-so-slightly naughty in south-west London. Len built aircraft in Battersea in World War Two and recalled being on the receiving end of the Luftwaffe in 1940 when he had to shelter beneath the snooker table in Tooting Conservative Club. He suffered from a rare bone disease and was the first person in Britain to be given penicillin. Not smoking and drinking and spending much of his life on a bicycle have kept him young and sprightly. Very sadly, Len’s wife of 73 years, Kitty, passed away a couple of years ago, so we’ll be calling in on her in Wandsworth Cemetery next week. He is a very special man, not least because he is the first person we have met who was actually alive at the same time as his Summerstown182 relative. Its quite a thought, but I have a vision of Uncle Fred in uniform, popping into Derinton Road before heading off to France. 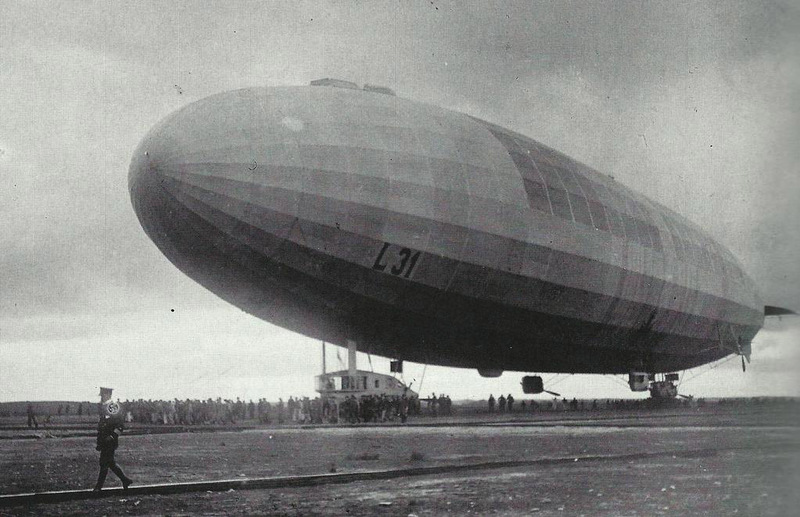 He patted his young nephew’s head and gazed up ruefully as Zeppelin L.31 slowly passed overhead. Many thanks to Gerry for her kindness and generosity, introducing us to Len so we have been able to tell this story. Grimsby seems very much on my radar at the moment. A few weeks ago I took an old friend to see the Mariners play at Woking. 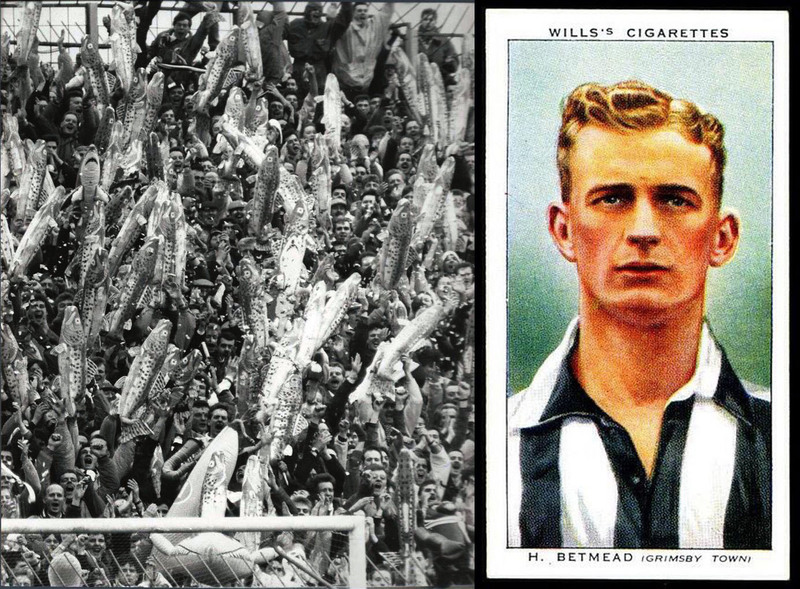 John’s had a soft spot for Grimsby FC since 1939 when a Billy’s Boots style footballer-cricketer called Harry Betmead signed his nine year old’s notebook. Apparently in those days they gave every visiting player a packet of fresh plaice. My own recollection is from half a century later, in the innocent pre-Sky days when football still had a sense of humour. Grimsby came to Plough Lane to play Wimbledon in an FA Cup fourth round tie and packed the away end with a sea of inflatable ‘Harry the Haddocks’. How incredible this week to find that one of the Summerstown182 had joined the 1st Battalion of the Lincolnshire Regiment in Grimsby in 1914. John Williams, a bacon provisions curer from Camberwell married Catherine Thompson in 1886. Their first child Frederick John Pritchard Williams was born on 12th May 1887. Sometime between 1891 and 1901 the family moved to the Kelvin area of Glasgow, where four of their nine children were born. Eight of these survived, five boys and three girls. 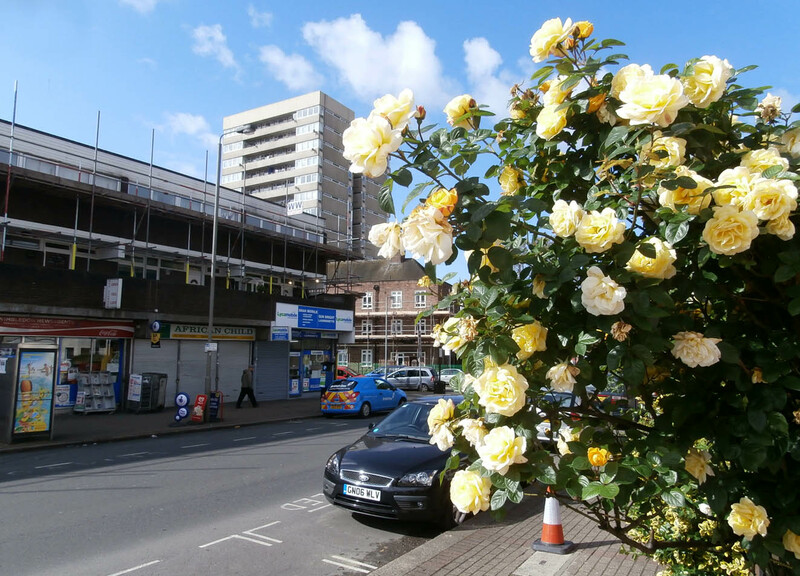 By 1901 they were back in Camberwell and like so many people from the area just south of the Thames, they were part of the great exodus to the open spaces of southwest London and descended on the daffodil fields of Pevensey Road. They were at No50, not too far along from houses that would be filled by the Cooks, Mangans and Dears in later years and close to the Dell family at No35. Definitely more the posh end of the street, with a lovely view of Smallwood School and, if it had been around at the time, the helicopter landing-pad on the top of St George’s Hospital. Fred was not present for the 1911 census and the next we hear from him is Grimsby. On 1st October 1916 one of Fred’s sisters, Maria Jane Williams married a soldier called Sidney Piercey in St Mary’s Church. The certificate is preserved on the same page of the register as Eldred Henden of the Summerstown182, who wed Grace Lowe one week later. Catherine was living at No50 until at least 1932 with son George who served in the Navy until 1929. Quite why Fred ended up in Grimsby joining the Lincolnshire Regiment is a mystery. A medal card survives bearing the date 26th January 1915 when he arrived in France. On his attestation he listed his home town as Tooting. He was wounded in France, very likely in the fighting at Aubers Ridge. This disastrous attack on 9th May was abandoned because of a lack of shells and the huge numbers of casualties, 11,000 in just two days. By the end of the war 75% of the 1st Lincolnshire Battalion had been either killed or wounded. Fred was brought back to hospital in London. His death on 23rd May 1915 is recorded at Whitechapel and he is buried in the magnificent Kensal Green Cemetery in west London. He is in good company there with the likes of Isambard Kingdom Brunel, William Makepeace Thackeray and Blondin who crossed Niagra Falls on a tightrope in 1859. Three of Fred’s brothers are on the absent voters list at 50 Pevensey Road in 1918; William was in the Royal Army Medical Corps, George and John were both in the Navy. A bizarre twist in the tale of Fred Williams is that his identity was assumed by another serviceman who also lost his life in the First World War. The service record of a George Samuel Layton confirms that he served as a stoker as Frederick John Pritchard Williams from 1906 until his drowning on HMS Strongbow in October 1917. How and why this came to be will remain a mystery. Soldiers serving under an alias was not unusual, but taking a person’s identity seems particulalry odd especially as they were still living. Its very likely that George came across Fred some time around 1906 when he was nineteen, perhaps there was some drunken scrape or a game of cards, somehow Fred lost his papers and George went off with them? To keep the ruse up for eleven years was quite something. In the remarks column at the bottom of his service record a handwritten note reveals the truth ‘according to relatives this man’s correct name is George Samuel Layton. Served as FJP Williams’ In fact its quite possible that Fred’s parents John and Catherine at 50 Pevensey Road would have received two notifications of his death. Quite literally, he is, the man who died twice. UPDATE: In July 2015 I got an email from Reg Harvey, a nephew of Frederick John Pritchard Williams, who was delighted to come across this post. ‘By happy chance, we discovered your website and your article, “The Man Who Died Twice”, and are most grateful to you and your team of researchers for solving the mystery of Frederick’s death’. 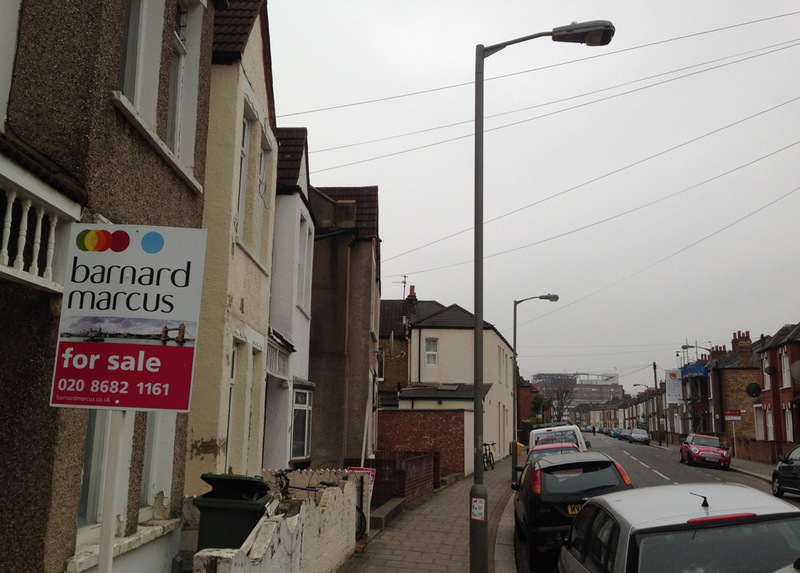 Reg knew 50 Pevensey Road extremely well, having been born there in 1929. 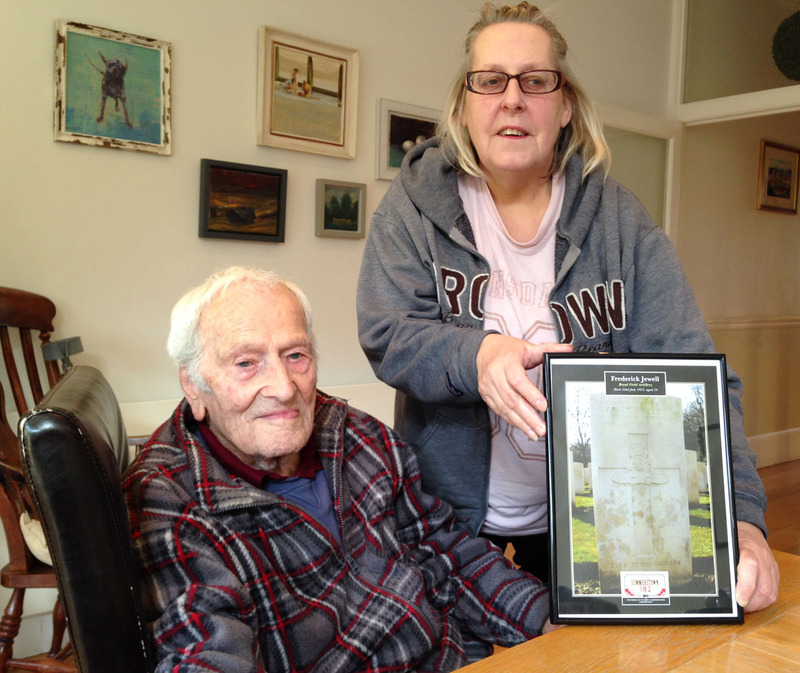 He explained that he and his wife had recently been researching their family histories and were keen to discover the burial place of Frederick Williams. They were totally bemused to find a naval service record showing his death at sea in 1917 when the family knew him to have died in the UK from wounds received in France while serving in the Army. Reg was aware that his uncle had served in the Navy but his information was that he deserted and was believed to have worked as a trawlerman until the outbreak of the First World War. Then, under an amnesty, he had volunteered for the Army. This explained how Fred came to be in Grimsby and his choice of regiment, the Lincolnshires. Reg’s father was Charles Frederick Harvey and he was married at St Mary’s Church on 28th September 1928. 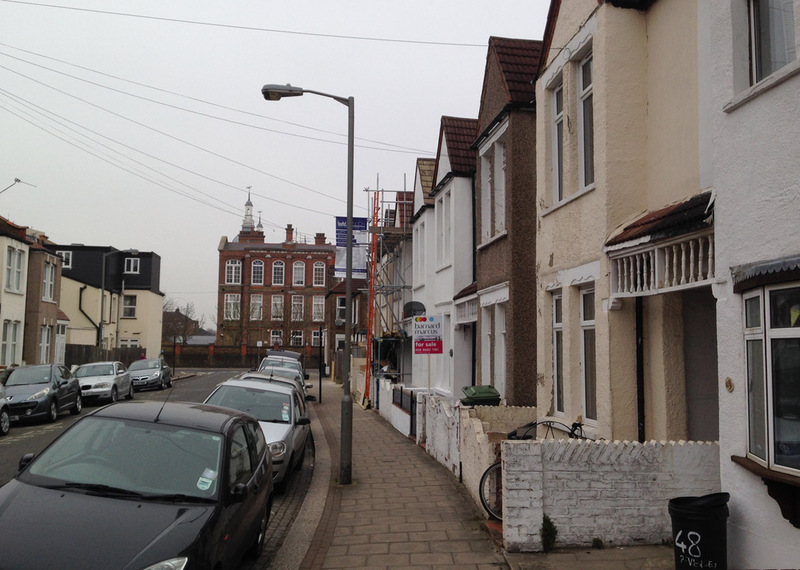 He and his wife Lilian took over the tenancy at 50 Pevensey Road after Catherine Williams’ death. Charles was a Royal Navy veteran of the First World War who died in 1943 when serving in the London Fire Brigade. Reg’s mother, Lilian Annie Williams, lived in the house until her death in 1976. A few weeks later I made a trip to St Mary’s Roman Catholic Cemetery in Kensal Green to visit Fred Williams. I had been to The National Archives and was on my bicycle and considered it would be a pleasant little afternoon diversion. It turned into an epic trek, through endless rebuilding schemes in Acton and Willesden with trucks, construction sites and roadworks at every turn. Via a path alongside The Grand Union Canal, I finally emerged near Wormwood Scrubs prison and the back of St Mary’s Cemetery. It is quite immense and seemingly packed with Irish, Italian and quite a few Polish graves, a gothic riot of statues of Mary, Jesus and assorted saints. One famous incumbent is the Jamaican-born Mary Seacole, known for her outstanding nursing work at the Crimea. The war memorial is tucked away in the south west corner, rather unattractively situated next to an old brick warehouse. Fred’s name was easy to find, on the wall directly behind the cross. Each of the names had a number after it, (Fred’s is Number 1) which appeared to correspond to 16 flat stone slabs to the left of the cross where presumably these individuals are buried. The cemetery is a very special atmospheric place, perhaps not as well known as its ‘Magnificent Seven’ neighbour but well worth a visit. In the office a very friendly woman looked up the burial register and confirmed that Fred Williams died in the London Hospital, Whitechapel. In a further development, just before Christmas 2016, Lisa Bacon contacted us to say she had come across this post. Her Great Uncle was George Layton and she has very kindly allowed us to share his photograph of him. Many thanks to Marion Gower for the research on this story, Ray Armfield for the Harry the Haddock photo and Woking FC for a lovely day out. The St Mary’s Church parish magazine of June 1917 contains an extremely moving tribute to a young man who Reverend John Robinson knew very well. It is a simple passage, but deeply heartfelt and I have recited it on several occasions as we have stood across the road from the site of his home on our Summerstown walks. The man was Charles Barnard Richmond and his family lived oppposite the south door of the church. Around 1969 the small row of terraced houses here were demolished and replaced by a dual-purpose block with shops at the bottom and flats on top. 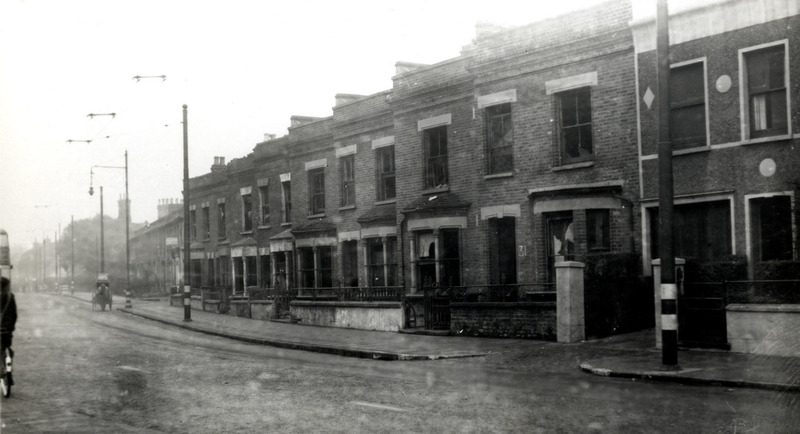 The address at No17 has for about ten years been the location of a charity called African Child, but the original house was a little further down the road on the corner of the point where Foss and Hazelhurst Road once met. 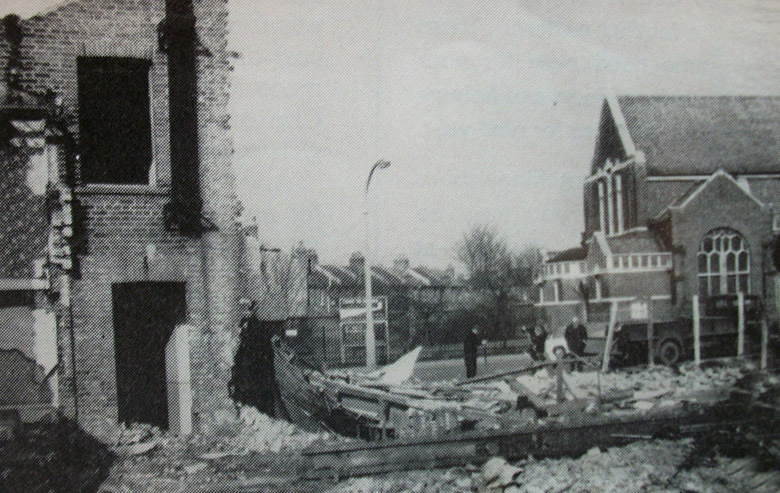 A 1940 photograph shows the house after a bombing raid when a number of these houses in Wimbledon Road were damaged. 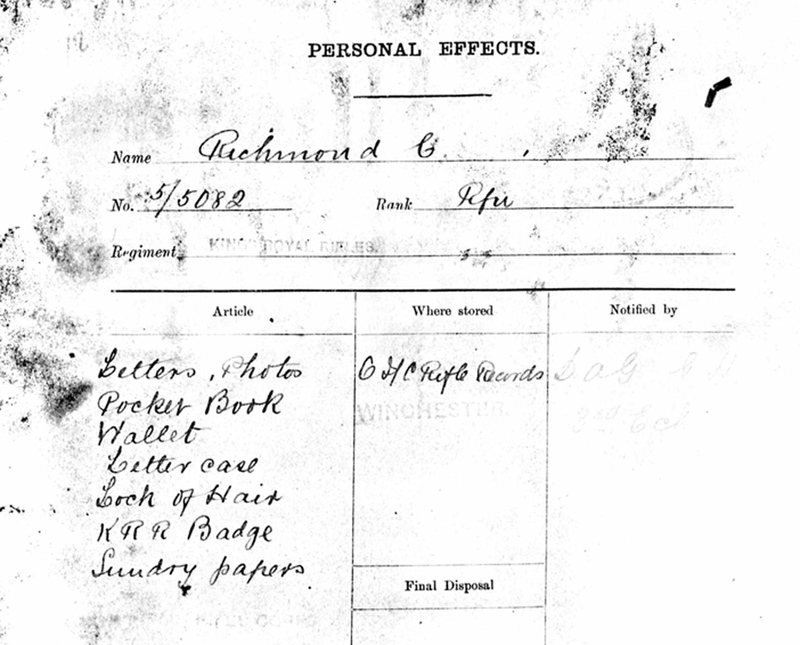 The vicar’s eulogy reads ‘Mr and Mrs George Richmond have heard in a letter from his officer that Charles, their only son, was killed on 9th April. The officer speaks very highly of the character of Charles, so well known to many of us, and says his loss will be deplored by all the men who knew him. Charles was prepared for Confirmation here, and was confirmed in 1912. He was one of our boys. How many of them, alas! we shall not see again in Summerstown’. The words are from the heart and painful to read, even one hundred years later. We can only wonder how many letters that officer wrote, but how fine it feels that his words can still be cherished almost one hundred years later. It is also very wonderful that a year after reading this for the first time, we now have a photograph of Charles and are in touch with not one, but two of his relatives, who contacted me independently from different strands of his family tree. Joanne Sear who lives in Cambridge was first to find us, having come across the blog after a bit of random googling. She told me some very interesting things about her Great Great Uncle, the younger brother of her Great Grandmother who was one of Charles’ three sisters. She remembered seeing a photograph of the four of them picnicking in a field. She had often wondered whether he was commemorated in any way in the area where he lived. He was the second youngest child of George and Lucy Richmond and it seems that Charles was a much wanted and cherished son. In 1901 Charles was five, Elsie ten and Dorothy eight. Constance the youngest, was four. Two of the girls moved away from Summerstown, but Dorothy whose husband was killed in the war went back there afterwards with her three young children including Joanne’s grandfather, to live with their parents. 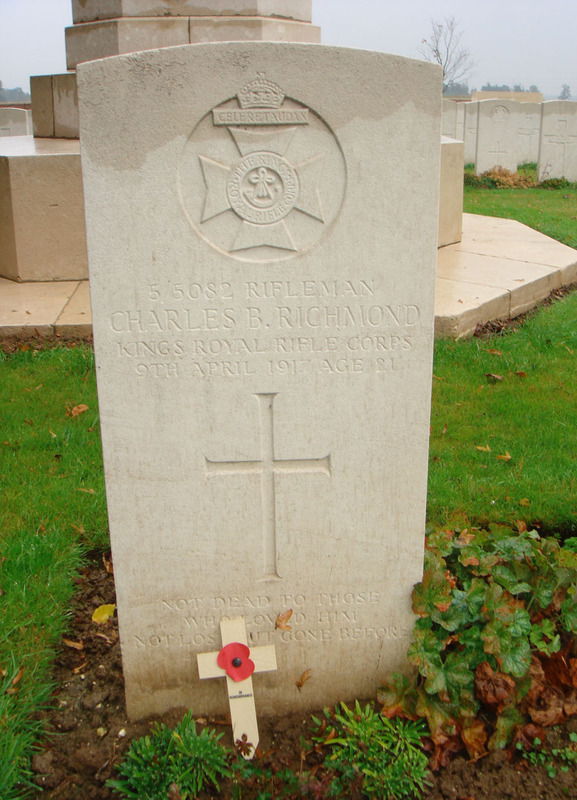 Charles was killed on the first day of the great battle of Arras on 9th April 1917. Joanne believed that his parents were distraught at the loss of their only son. The story within the family was that his mother was so upset that she never smiled again. 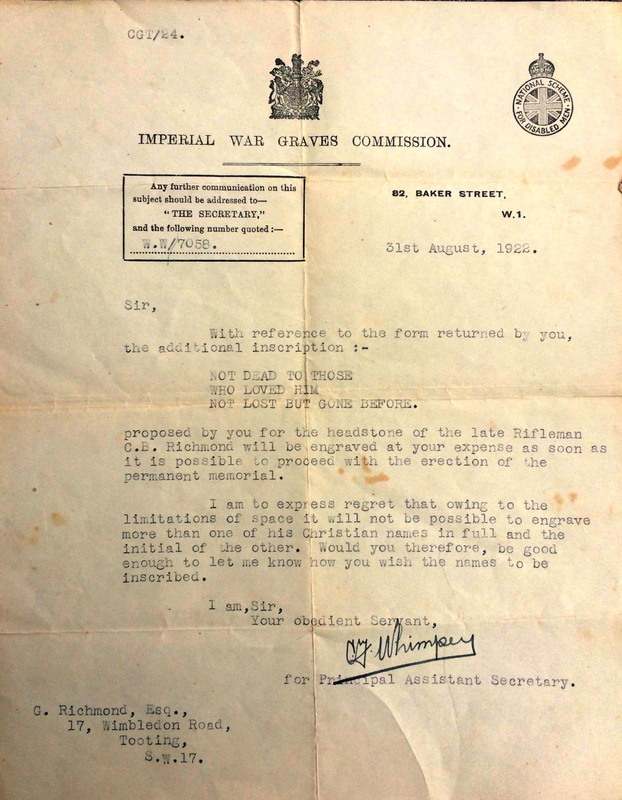 Joanne has a a letter received by Charles’ father from the Imperial War Graves Commission regarding the inscription on his grave. ‘NOT DEAD TO THOSE WHO LOVED HIM, NOT LOST BUT GONE BEFORE’. It informs him that due to lack of space it will not be possible to write both of his christians name in full on the headstone. On a school field trip a few years ago, Joanne’s daughter visited Charles’ grave in Tilloy British Cemetery and placed a wooden cross on his memorial. Tilloy-les-Mofflaines is just to the east of Arras. Charlie is less than a few miles from the final resting places of two other members of the Summerstown182, Samuel McMullan from Franche Court Road in St Nicolas and Edward Seager from Thurso Street in Feuchy. A few weeks ago I then got an email out of the blue from Simon Turner, the Great Great nephew of Charles Richmond. He was able to supply a photograph and full military record. Simon had also been to the cemetery at Tilloy in January last year. Charlie’s records which have survived the blitz show that he joined the King’s Royal Rifle Corps in the first wave of recruits in August 1914 in Stratford at the age of 18. He had been working as a clerk, now he was stationed first in Winchester and then Sheerness. He went to France in 1916 as part of the 9th Battalion before the battle of the Somme and would have seen action at Delville Wood. Over the 24th-25th August the 9th Battalion cleared the wood capturing 9 German officers and 159 other ranks, at a cost though of 300 casualties. 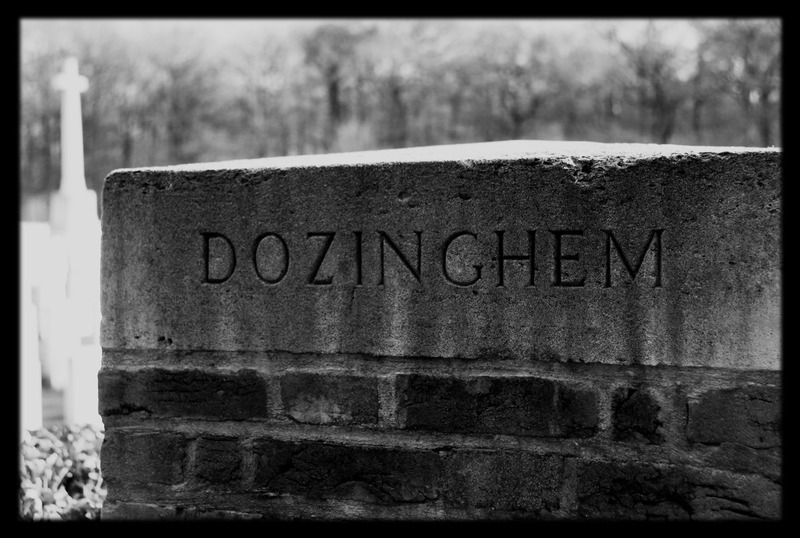 ‘Devil’s Wood’ is a byword for some of the most fearsome fighting on the Somme. It is now the location of the South African National War memorial and whilst the trees were all razed to the ground and the wood had to be re-planted, a single original surviving tree still stands. 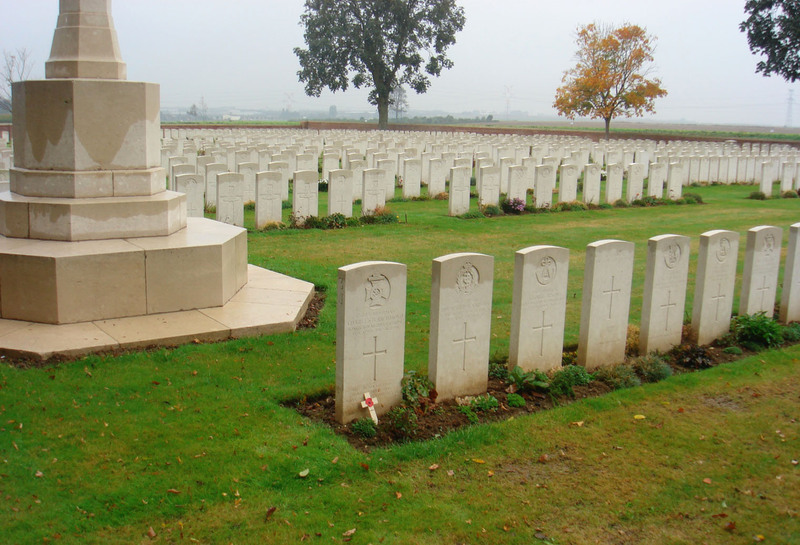 ‘The 9th’ were part of the 14th (light) Division at Arras and Charles was killed on the first day of the battle. The King’s Royal Rifle Corps Association website records that the battalion attacked what were known as the String of Harp trenches. They achieved their objective, but uncut barbed wire and furious machine gun fire accounted for heavy losses and 210 officers and men were killed or wounded. Its really quite hard to read some of the paperwork in this collection, the documents are so charred and smudged. They do though suggest that in spite of his glowing reference from the vicar, Charles was no angel. Nothing too serious mind, but he was absent from leave a few times and as a consequence confined to barracks and forfeited pay. He also endured a two day dose of Field Punishment No2 in August 1915 after one particular walkabout. This was similar to Field Punishment No1 as meted out to Alfred Chipperfield, but in this case the offender whilst still shackled, was not fixed to anything. On 4th September Charles was promoted to the rank of Lance Corporal but in mid-December he was in more bother after another absence and forfeited his stripe. 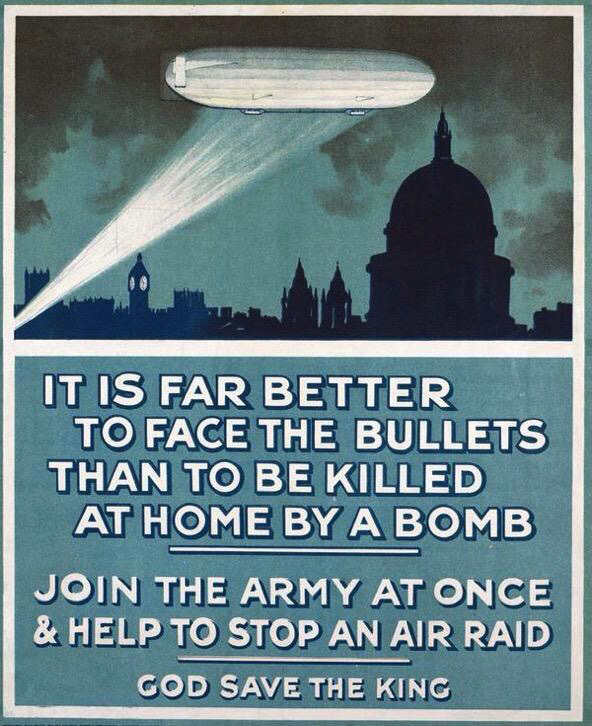 Curiously this didn’t come into effect until May 1916. Also in the files are two anguished letters from his father, one in a very distressed tone questioning the whereabouts of a will and the other one acknowledging receipt of Charles personal items. In one of these he describes how ‘he was my only son and a dear boy’. Amongst Charles’ personal effects which would have been retrieved from him after his death are the usual items you might expect – a wallet and pocket book, his badge, sundry letters, papers and photos. But intruigingly the document also mentions that among the keepsakes in the possessions he left behind was a lock of hair. We are very grateful to Joanne Sear and Simon Turner for allowing us to use this photos and share their family memories.